Tony Bennett is staying mum on David Evanier's secrets-baring biography of him, but the author says he's been told the crooner's son would like to fly him on a one-way trip to the moon. 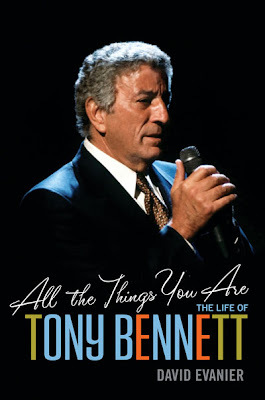 Six months after Wiley published Evanier's "All The Things You Are: The Life of Tony Bennett," the former Paris Review senior editor says he'd love to get some feedback from the singer, but all he's gotten is second-hand guff from his son and manager Danny Bennett. Evanier says the 85-year-old music legend's longtime press rep, Sylvia Weiner, informed him that Danny is angry about "inaccuracies" in the book but won't be specific. "Nothing was cited, not a word," says Evanier, who insists: "There are no inaccuracies." He says he interviewed more than 60 individuals for the book and spent 2 1/2 years finishing it. Rather, Evanier suspects Danny is upset because the book shines a spotlight on some of the less savory aspects of his father's life and career. "I celebrate him, but not in a way he wants," Evanier says. "He's not Snow White, but no one is." "All The Things You Are" chronicled the rise of Bennett -- born Anthony Dominick Benedetto, which means "blessed" in Italian -- from Astoria, Queens, to the pantheon of popular music. Along the way, Evanier documented Bennett's service in World War II, where he helped liberate a Nazi concentration camp, his participation in the civil rights movement and other noble moments. But he also wrote about Bennett's struggles with pills and cocaine in the 1970s and his controversial ties to organized crime. Bennett, Evanier writes, received money from the Capone family to help jump-start his career. He also quoted musicians who saw Bennett at mafia events over the years and got Bennett's late former manager Derek Boulton to corroborate that in the late 1960s, Bennett forked over $600,000 to the mob to get them off his back. The author also says he's heard Danny took offense at passages in which his father is referred to as "banana nose," a derogatory nickname given to the singer by the late jazz pianist and vocal coach Tony Tamburello when the pair auditioned for the mob in the early 1950s. Publishers Weekly described "All The Things You Are" as "heartfelt" and noted that "Evanier's passion for Bennett shines through." The New York Times called the book a "raw, quintessential New York story" and "unvarnished." Evanier calls Bennett "one of my heroes" and says he'd just like some honest feedback from the singer. "It's not an expose, it's a real story," says Evanier, who notes that Bennett spent a "a lifetime being Mr. Sweetness." Weiner and Bennett did not respond to our requests for comment by deadline.